I am in a 40 day window of leaving for Semester at Sea…Packing, clearing out closets, releasing THINGS and documenting processes in my house as preparation for this voyage/soon to be life changing journey. I am getting lots of help from friends to make this happen – so grateful for my Circle of Trust! In this pre-trip period now that it is getting closer, I’m starting to sequester myself…leaving days completely open to do stuff. All these little things that take 10 minutes, 30 minutes, an hour – all add up to days and the days seem to be accelerating! 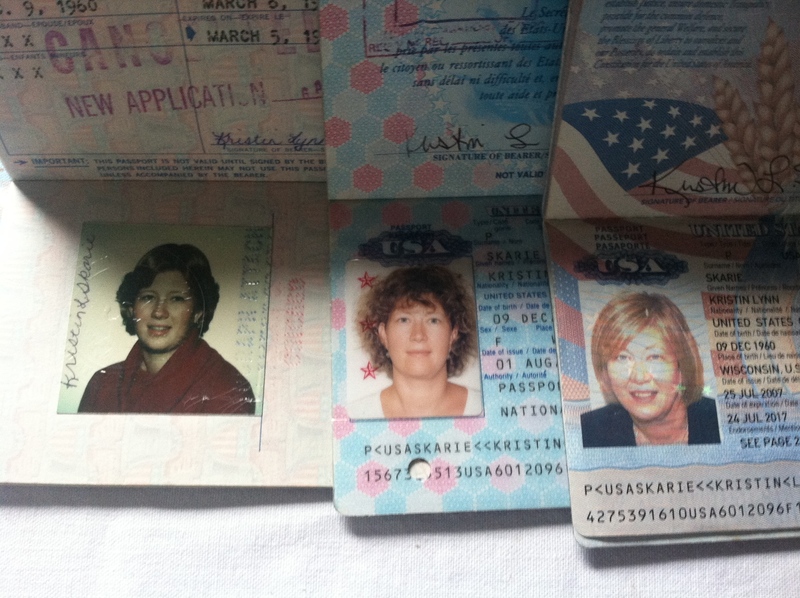 Cleaning my office….looking through receipts, rereading old letters and references and unearthing my old passports has made for some interesting flashbacks. I mean look at those pics – how much has changed (my hair…and WHO IS THAT in the middle pic) AND how much I am still the same person. I am still an independent (to a fault), fun (yes? ), friend-blessed swimmer. AND I have changed in so many ways – learned so much in the past 30 years…yikes. So many cool places I’ve lived and traveled, so many wonderful people, and so many things to be thankful for…I am more confident, more resilient, more settled but will NOT settle. So much more aware that I have enough and that I am enough (Brene Brown!). More faithful, more trusting in the plan God has for me, more free, more me. In what ways are you the same as you were 30 years ago (or 20 or 10)? How are you different? Great day at Henry Hudson School #28 with my 4th Graders today….It’s a testing week so we did a little pep-talk activity – good times! 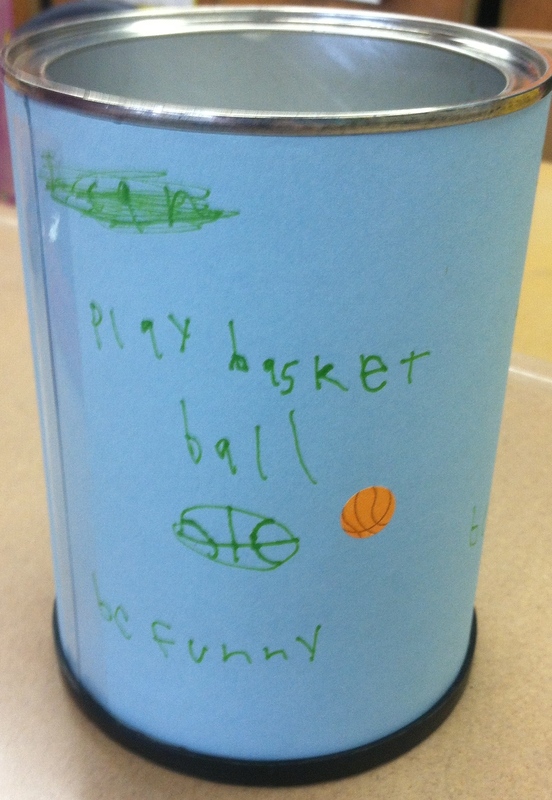 Students covered up a coffee can (perfect size – thank you Wegman’s!) 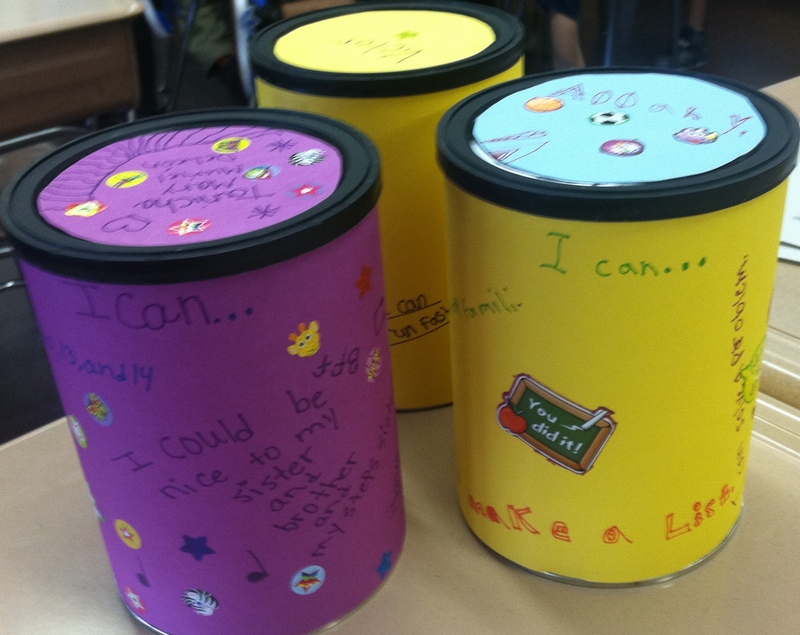 – the “I CAN!” – with decorated paper covered with the things they CAN do….I can study, I can be nice, I can be a helper, I can be funny, I can make lists, do math, solve problems, stay focused, work hard, do tests, play sports, speak Spanish, speak English….and so many more! Then inside the can – they dropped themselves a little pep talk slip to remind themselves to be in the right mindset for the testing week. I will get good sleep this week, go to bed early, never give up, do my best, study…. 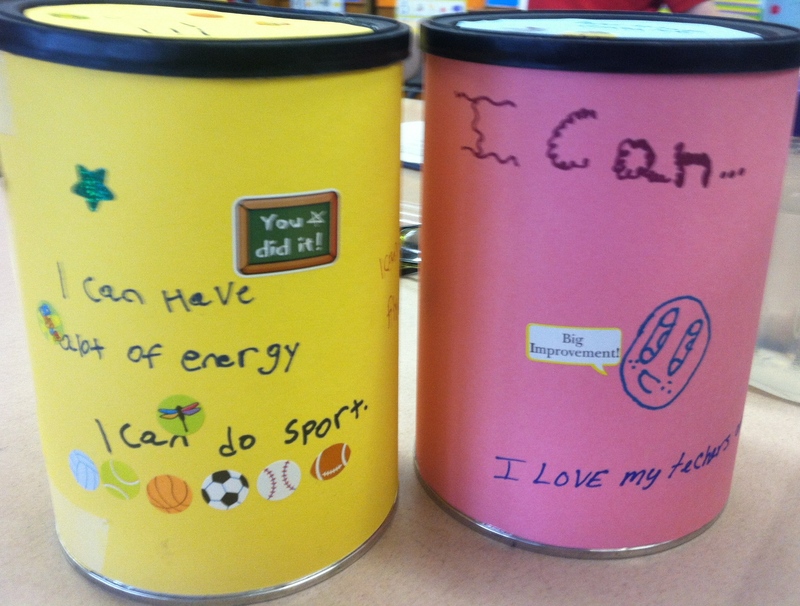 They will also fill out slips for their classmates and put those positive notes into each others’ I CANs…. Such an uplift! These children have it – the ideas, the support, the love….the trick is helping them keep it…. Good Luck Kiddos! And to anyone who has a “test” this week – YOU CAN! Met so many nice people on Saturday at Wegman’s – an all around happy day 🙂 Once again – we were all happy with the event – sold a few more books too! One new friend, Sue, works for Nalgene and she felt sorry for my 15-year-old Nalgene bottle so she went out to her car and got me a new one – yay! Another man bought my coffee as I was waiting in line to check out…so so nice. 1 cup of Witch Hazel, 1 cup of water, 20 drops of lavender oil and 10 drops of eucalyptus oil. That’s it! 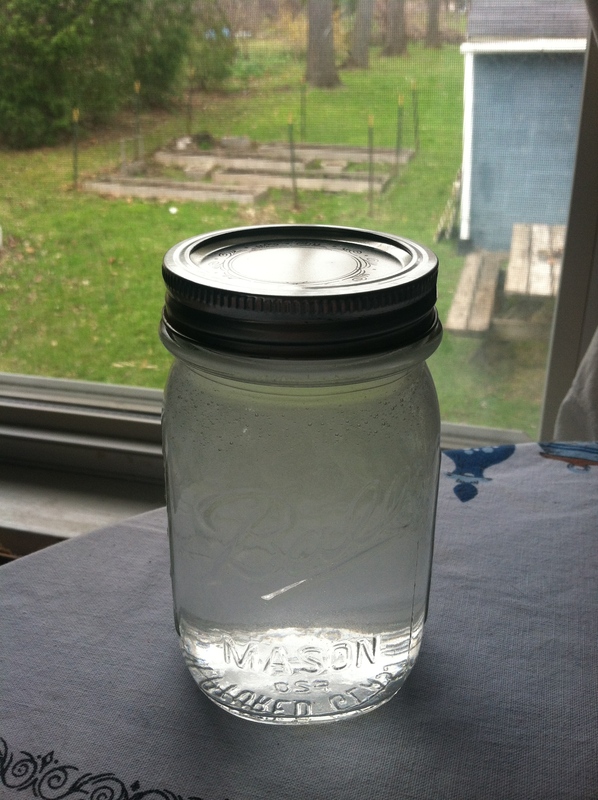 In a jar right now – will transfer to a spray bottle when it’s time. I took a quick peek at the ingredients on the Badger Balm brand bug repellent I got for my travels (Anti Bug Balm – in a solid stick form). Other essential oils there include citronella, cedar, lemongrass, rosemary and geranium – nice! Hooked the up with the Sustainable Women here in ROC…love, love, love to connect people – I am a Tinker Toy. Make new friends and keep the old…. Risk. Not the game – the real thing…and its older sibling Fear. Palling around, having coffee, reminiscing about the good old days and feeding off each other…nice that they have a relationship but…I embrace Risk but I don’t really want to hangout with Fear! They don’t come as a package deal so I choose Risk alone – no Fear, thank you. Before I go too far into this personification exercise, I will state out loud (here) that I sent my book to Barnes & Noble. It is now up to BN to decide. 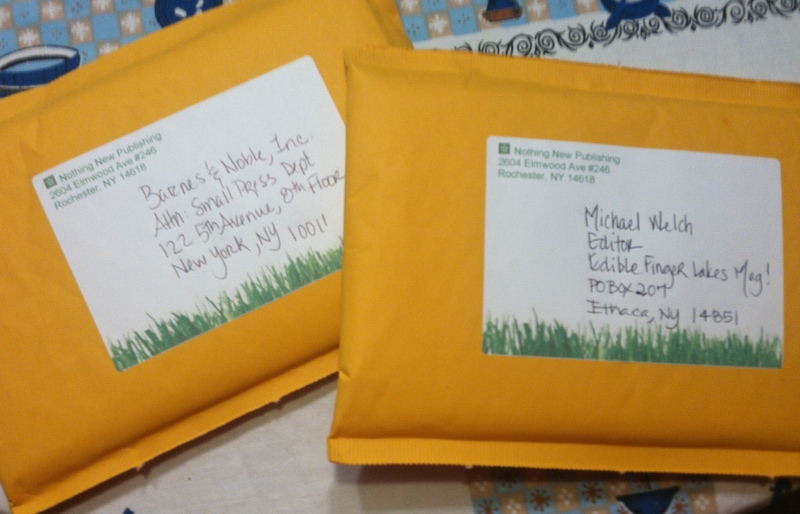 And to Edible Finger Lakes Magazine…AND a list of others to approach….all building up to Real Simple Magazine! Risk will have me over for coffee – will let me look around a little and help me think things through….Risk and I are a little more aligned on our values and there is room for discussion…Risk and I have a friendship to cultivate and nurture. There may still be messages of learning but in the form of kind reminders and gentle nudging for change…That is my kind of friend. What kind of relationship do you have with Fear? How can you get to know Risk better? Henry Hudson 4th Graders are College Bound! 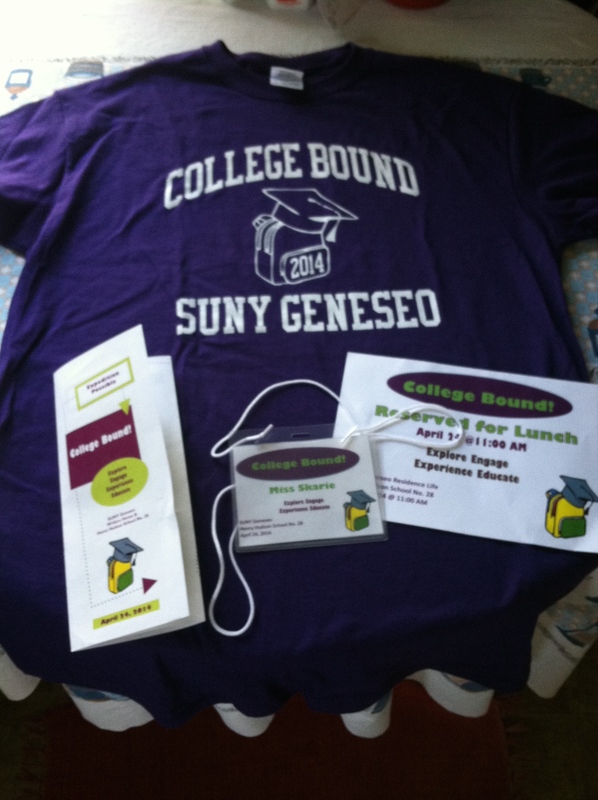 Spent the day with 19 4th graders and 16 parents/family on the SUNY Geneseo campus today….woo hoo! This was Year 2 of a program that was born on December 18, 2012 in Java’s – a cool coffee house here in ROC. Sarah Frank at SUNY Geneseo is the main brain on this one – she is an expert collaborator! We were talking about “my kids” at Henry Hudson School #28 that night and Sarah casually asked, “What if the kids came to campus?” Let there be College Bound! She pulled in Vicky Gebel and Kevin Hahn and we went to campus last year on April 10 for a Day of Wow! This year, Sarah and Team along with least 7 other colleagues and about 20 student volunteers to made the day happen. Plus crucial support from Dining Services, Parking folks, Facilities and Residence Life offered overall TLC of this program and these children. We took a bus to campus from school – an adventure in itself! – and got there in time to go right to lunch. Every kid and parent/family member had a nice bag lunch – along with personalized name tags, a folder, a College Bound button AND a College Bound T-shirt for the kids with all of their names on the back – wow! 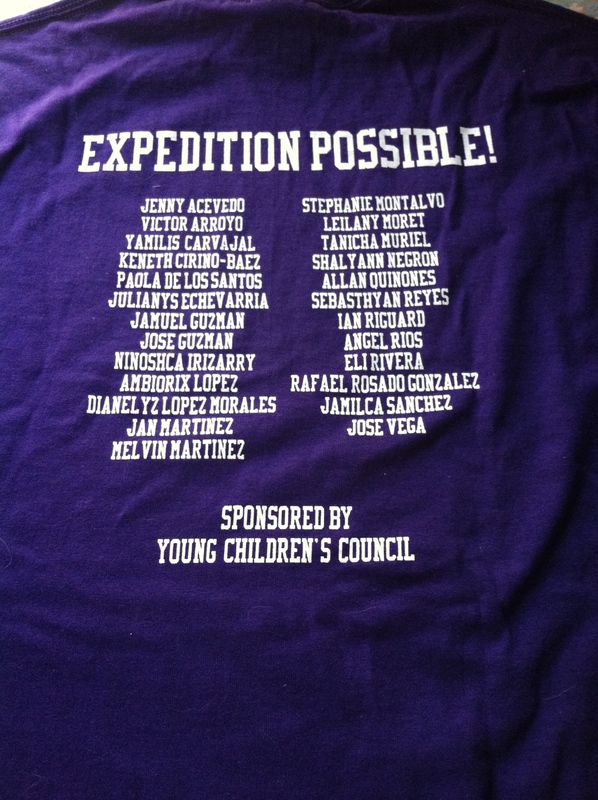 Huge thanks to Young Children’s Council for the beautiful shirts. It was so fun to watch them find their name at the table and then enjoy lunch as a Henry Hudson team! Parents/family were taking pictures of their kids, then enjoyed their lunch as well. The few kids without family that day were absorbed by teachers and volunteers – everyone was hooked in. Being College Bound in a College Going Culture – to be college ready by the time a student graduates from high school – is the dream. Planting the “I will go to college” now – in 4th grade – is exactly the right time. There are some existing College Bound initiatives in place across the country that we many try to connect with as we plan for college Bound 2015. In the meantime, 19 more children have a little more motivation to come to school tomorrow. My (almost) two hour nap yesterday afternoon allowed me to rest up for a memorable time last night with some new friends at Wegman’s. 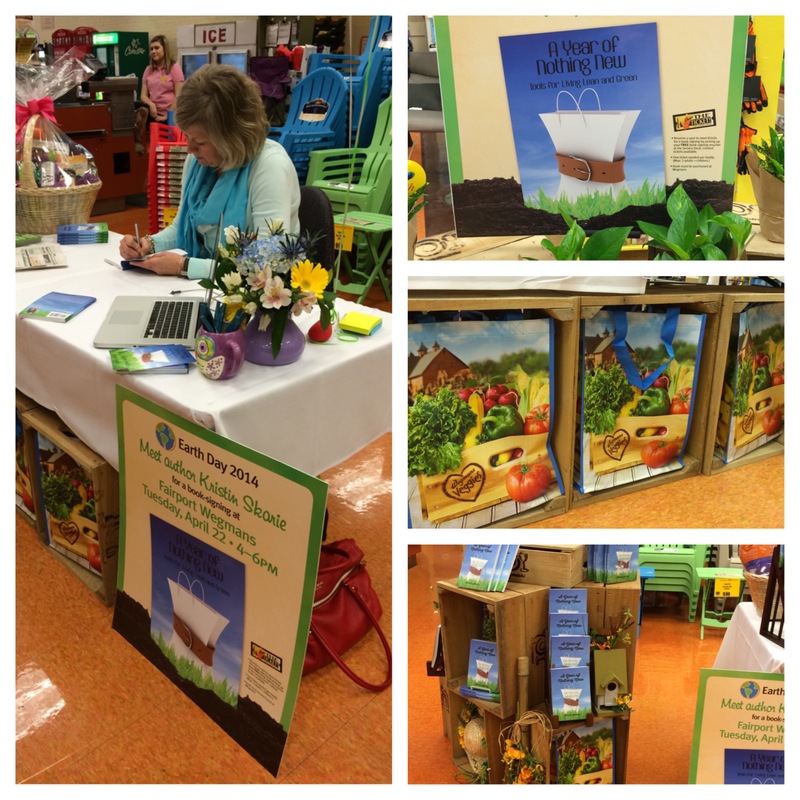 The best thing about the book signing was the absolute joy exuding from the Wegman’s team who put the event together! Thank you Angela, Denise, Melissa, Joe, Christina and Julia AND to my friends who stopped by….love, love, love! They were genuinely happy for me and so excited – they made me feel like a celebrity! It was a huge reminder to be aware of what I do to make the people in my life (and new friends!) feel “famous” – if I could do for my people half of what Weggie’s did for me it would be a reward in itself. Gratefully, their hard work made for a successful program for both of us – I will head back for a repeat on Saturday for their “Celebrate Organic” Day – so fun! What brings you joy? How do you make the people in your life feel like celebrities around you? How are you connected? Rainy/cooler day today is in large contrast to sunny/warmer day yesterday. Maybe yesterday was really Earth Day because it was so nice out and it was an easy day to love. Or maybe it IS today and this Rainy Day is just as valid as it’s more popular older sister, Sunny Day. Maybe Rainy Day is here to share new lessons or expose hidden truths. Deep thoughts. No matter – today is another day given to me to be my best self and allow others to do the same. Had the lovely opportunity to talk with my Good Day Rochester People earlier this morning – Adam Chodak said (approximately), “Let’s welcome the awesome Kristin Skarie to talk about natural cleaning products!” – OK then – let’s! Norma Holland was her alway positive self with kind inclusion and letting me share what I know…Good times – such open, fun and professional folks. An Earth Day blessing! In contrast to the energy they exude and my reciprocated enthusiasm about vinegar and baking soda – I am now fading fast and very tired. Long day today and an emotional roller coaster this past week are my claim for TIRED. In my ideal world…if I could have the (my) world anyway I wanted it, I would have a nap right now. “Tomorrow’s Headline” would read, “Kristin Skarie Naps on Regular Basis – All Sleep Needs Met”. I like to sleep. I envision a world in which I sleep as much as I need and every day I feel rested and ready – every day. This is my Vision. Thank you LeaderShape for the Visioning Process. I will be with you in LeaderShape-ness at Auburn in two short weeks! This is preparation. Blessings abound and so much to do, yet on this Rainy Day I am a little down – while the laundry spins (with my homemade laundry soap – yay! ), the rain falls (which means the back hoe next door is quiet) and the work awaits, I am searching for motivation and inspiration. Not from TV or Facebook for sure, I need a revival for today – a boot, a kick, a push to start each project and touch everything once to get closer to the finish line. A walk around or a nap. I know both of these are luxurious choices. Flash forward 2 hours. I took a nap. Thanks again to Sustainable Women! A great group of local women who love to share what they know about about being a green steward of the place where you live. More Cleaning. More Learning. Save money and save the planet….Happy Day Before Earth Day! Soap $2.49 + Soda $3.49 + Borax $3.79 = $10.97…..$7.09 for the mixture I just made – 88 loads @$.08 per load – yay! Compared to a fairly high-end laundry soap in a paper container (I was using this – I do love it but….) at $12.99 for 66 loads – that’s $.19 per load. A little higher than a mainstream brand ($.14 per load) but worth it was for me to know I was being nicer to our lakes and streams. When shopping for green brands – do consider the higher cost an investment in our lakes and streams….AND do your research! It is easy to fall into “greenwashing” traps with beautiful, earthy, groovy looking packaging and key words like natural, organic, earth-friendly…you know what I mean! I am easily swayed by these and believe me I understand the allure 🙂 The Good Guide App is really helpful, so is the PETA list for companies/products that are cruelty-free. There are so many choices out there now – ones that are kind to humans, animals, the planet and your home! If you can, go for the simple, clean, old-timey stuff and forget about the fancy smelling, way too colorful and over-packaged products that cannot multi-task. 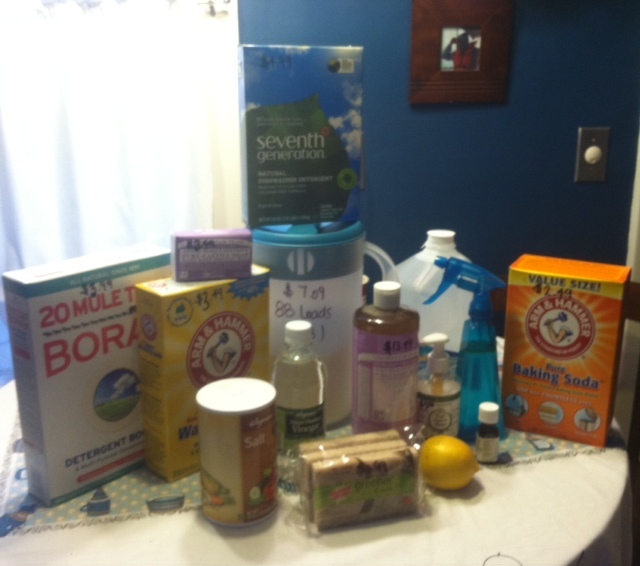 Give me some baking soda, Dr. Bronner’s, Vinegar and Borax…. Ending = Beginning = Ending = Beginning = Ending = Beginning = Ending = Beginning. Sometimes things end and there is no way to summarize. And that produces sadness, chocolate eating and tears. Somebody call me a wah-mbulance. I am horrible at endings because I love to summarize. And sometimes there are just no more ways to summarize. Sometimes decades of summarizing need to just be done. I am done. I have no closing sentence for this one. 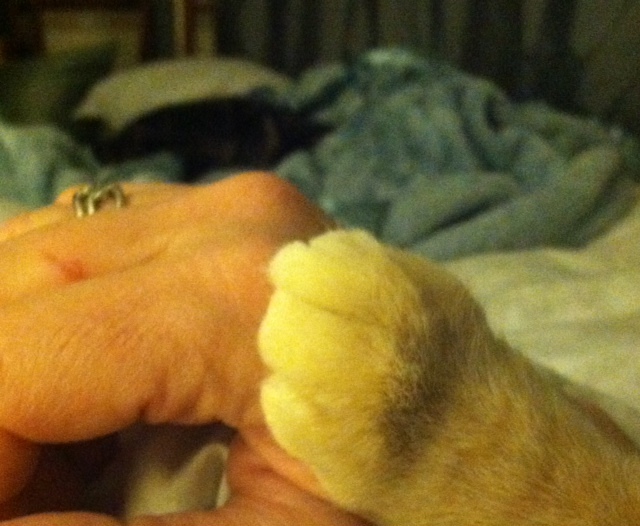 Reinforcement of a good decision and strength coming from trusted friends, Mom, kitties, coconut milk ice cream, Emergency Kittens on Twitter and Jesus. Trusting the process – as we always say in LeaderShape – AND hard to do in difficult times. It is going to be OK – blessed reassurance. “What did Mars say to Saturn? Give me a ring sometime!” Hee hee…. This bit of joy – courtesy of Dave at one of what I consider to be “my” post offices. I know Dave and John by name here – and Diane at the other one. These folks have the gift of hospitality – the ability to make me feel like a special (favorite?) customer and that I am SEEN. Diane bought a copy of my first book – the one with a few short stories. She bought my second book too! And watches my TV gigs. Nice. I know about her family, her vacations and we talk about hair. John – hmmmmm….well, I know some of his back story – shared in numerous 3 minute conversations while I am buying stamps or mailing packages. He calls me Dharma (remember that show – Dharma and Greg?) I must look like Jenna Elfman to him – I will take that as a compliment. He is outgoing and kind and at times seems a little sad. Dave – always happy – and now I think he shares a “joke of the day” – I am good with that! Makes waiting in line quite a bit more enjoyable. Can friendliness be learned? Is it a skill? Or is it a personality trait. Something you just have. In your DNA and passed down the line? I want to be known as friendly…..OK and also funny. And generous. And funny – very funny. Friendliness as a way of life oozes from my neighbors on this street I call home. 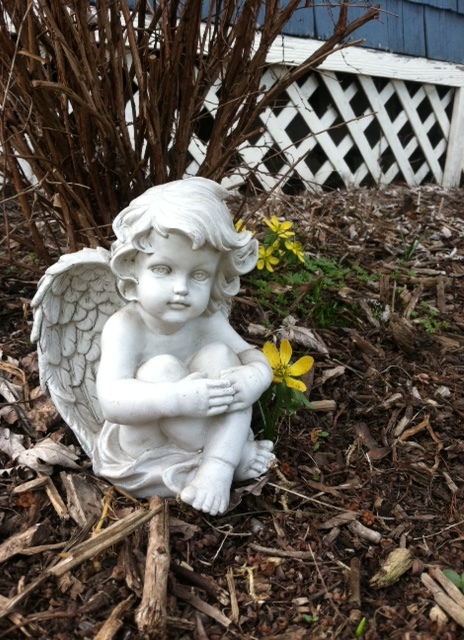 Especially, recently, the kindness I received in the form of this garden angel came from Joetta and Kurt. This little gal belonged to her Mom who passed away recently. As we I talked on her sunny front porch this weekend (that one day, when it was warm) she gifted me this angel that was at one time in her Mom’s garden. 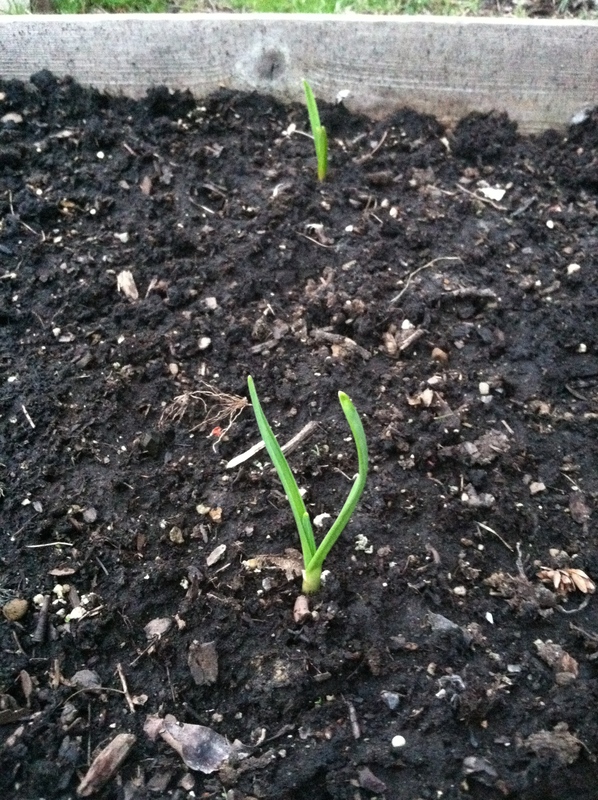 What a privilege…I placed her immediately as a “First Rites Spring Garden is Getting Ready” symbol. I love her – Joetta and the angel of course. This is one so many things they do for me – who they are for me. These are the kind of neighbors you would script for yourself and a shining example of the kind of friendliness we have here. LUCKY. Who is friendly in your world? How do you want to be known?